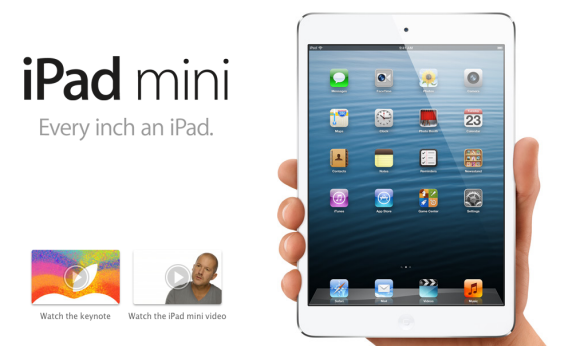 iPad Mini launch: Apple unveils new Ipad features, price, size. Apple’s New iPad Mini Is Pricey But Sleek. Or Is It Sleek But Pricey? Apple on Tuesday unveiled a new, smaller iPad with a 7.9” display. It’s a computer! It’s a phone! It’s a tablet! Well, yes, it’s a tablet. But Apple’s new iPad mini, announced at a launch event Tuesday, is a very small and sleek tablet, with a screen that measures 7.9 inches diagonally. More impressively, it’s the width of a pencil and weighs just 0.68 pounds, about as much as a pad of paper, noted Apple vice president Phil Schiller. It has the same 1024-by-768-pixel display as the iPad 2, has front and rear cameras with HD video capability, and runs all of the same software as its larger sibling. “Others have tried to make tablets smaller than the iPad, and they’ve failed miserably,” Schiller said graciously, before launching into a side-by-side comparison of the iPad mini with a similarly sized Android tablet. The iPad mini will start at $329 for the WiFi-only version, which Schiller noted is the lowest price ever for an iPad (though still more expensive than many other tablets on the market). Versions with more memory will cost $429 and $529. For the version with cellular service, the prices are $459, $559, and $659. The WiFi version will begin shipping in the U.S. on Friday, Oct. 26, with the cellular version coming in November. Apple also announced a fourth-generation iPad Tuesday, just half a year after it announced the third-generation model. The company sold its 100-millionth iPad two weeks ago, and it said the iPad accounts for 91 percent of all browser traffic from tablets. Meanwhile, the company launched a new MacBook Pro and iMac. The latter is now the top-selling desktop in the United States. Update, 2:45 p.m.: The $329 starting price is on the high side of initial estimates, some of which had been as low as $250. That’s twice the price of Amazon’s Kindle Fire, and the figure has clearly disappointed some. And while the screen’s resolution is the same as that of the iPad 2, it is not a retina display, so those looking for super-high-definition games and videos may prefer its full-size counterpart. On the plus side, the device maintains the iPad’s 10-hour battery life, and its cameras are unparalled by cheaper tablets. In addition, Schiller noted, “It’s not just a shrunken-down iPad. It’s an entirely new design.” That design is reminiscent of the iPhone 5, with its aluminum frame, and like the iPhone 5 it comes in white and silver or black and slate. It will also share with the phone the new “Lightning” connector. But Schiller highlighted the differences between the iPad mini and a phone more than the similarities. He emphasized that, unlike some competitors, it runs apps tailor-made for the tablet as opposed to scaled-up smartphone apps. That made it shine in the side-by-side comparison. In all, it looks like another impressive feat of Apple engineering. And, along with a flurry of other new tablets and phones on the market, it represents another step toward a day when the distinction betwen phones, tablets, and personal computers becomes arbitrary. Update, 3:10 p.m.: I couldn’t decide whether the headline should be that the iPad mini is “pricey but sleek” or “sleek but pricey,” so I went with both. Those who think it’s the former—that is, Apple loyalists who care more about how cool a new product is than how competitive it is on price—will probably buy the thing. Those who prefer the latter formulation—people who comparison-shop Apple devices against Androids and others on the basis of price and features—may pass on the iPad mini for now. Fortunately for Apple, there seem to be an awful lot of people in that first camp.